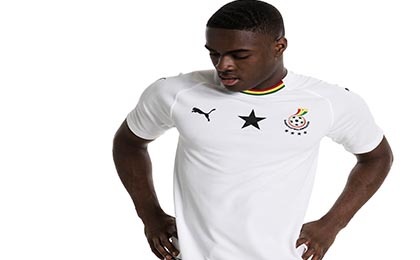 If you want to buy cheap ghana shirt for 2018-19 season, buy it here in cheap-football.com , Check our exclusive range of ghana Football Shirts / Soccer Jerseys and Kits for adults and children at amazing prices. Get the cheap ghana jersey shirts, soccer kits with wholesale price, Free Shipping Worldwide! Ghana national football team represents Ghana in international association football and has done so since the 1950s. The team is nicknamed the Black Stars after the Black Star of Africa in the flag of Ghana. It is administered by the Ghana Football Association, the governing body for football in Ghana and the oldest football association in Africa (founded in 1920). Although the team qualified for the senior FIFA World Cup for the first time in 2006, they had qualified for four Olympic Games Football Tournaments when the tournament was still a full senior national team competition; their best achievement was the third position at the 1992 Summer Olympics. The team has won the Africa Cup of Nations four times (in 1963, 1965, 1978, and 1982) and has been runner-up five times (in 1968, 1970, 1992, 2010, and 2015). After going through 2005 unbeaten, the Ghana national football team won the FIFA Best Mover of the Year Award and reached the second round of the 2006 FIFA World Cup. At the 2010 FIFA World Cup in South Africa, they became only the third African team to reach the World Cup quarter-finals, and in 2014 they competed in their third consecutive World Cup.